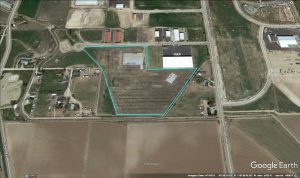 +/- 17 acres conveniently located in the Sky Ranch Business Center in Caldwell, ID. Manufacturing-friendly community with excellent freeway access. Two buildings were originally planned for this site; one is 42,000 square feet and the second is 10,000 square feet. The site drainage has been finished and the underground utilities are in. The land is shovel-ready; call for additional details. Sky Ranch Business Center is located in East Caldwell just off I-84 via the Franklin Rd./Hwy. 20-26 exit. The business center offers over 100 acres of fully developed industrial, office and retail lots. Aggressive incentives may be available from local and state agencies for qualifying businesses. The property is also within the designated Foreign Trade Zone boundary.